Williams golf ball in clear acrylic display cube. Sleeve of 3 Williams golf balls. 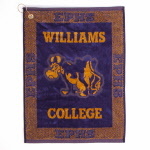 Golf tool with removable magnetic ball marker and gold medallion of the Williams College seal.